Photogize WebCentral is the next generation web hosting platform designed specifically for photo retailers who want more from their web investment: more customers, more connections, more commerce and more control. WebCentral offers a unique, reliable and responsive web experience featuring full consumer photo finishing and hard goods e-commerce with an award-winning production backend for local lab printing. Interact with more customers who want to connect with you in new ways…today you need to give your customers an optimal web experience on their smart phone or tablet device, as well as their PC or Mac. Photogize WebCentral employs media-savvy HTML5 and CSS3 to ensure your website is responsive to the full range of digital devices your customers will use to visit your website. Be sure you’re there for them anytime, anywhere. Local consumer web search results are critical to your web business’ success. Don’t leave your search engine ranking to chance. Photogize WebCentral was designed from the ground up to be search engine optimized. From search-friendly URLS to dynamic site maps to fully indexed products and content. A WebCentral site was designed to be found! Our built-in SEO optimizer dynamically generates XML sitemaps and submits them to Google after any change you make. And you can fine tune your site anytime using advanced Yoast SEO tools. 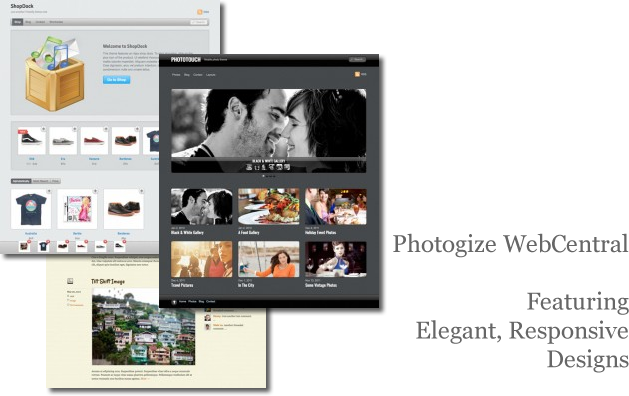 Photogize WebCentral include tight integration with Facebook, Twitter, Tumblr and more. Customers sharing your fresh content will keep you top-of-mind in your local market. See the social tags at the top right of this page? With WebCentral, we put those on every page and at the end of every blog post. But if it’s so stupid-easy, why don’t most sites do it? Only half of the largest 10,000 websites (or 53.6 percent) have at least one social link or plug-in installed, according to a recent study by SEO firm BrightEdge Technologies. An extensive ecosystem of WordPress partners and plugins are at your fingertips. We’ve tested and pre-installed some of the best plugins and widgets – activate them with a few clicks. Use Zopim to provide live chat, All in One SEO Pack for even more search engine optimization, Jetpack for incredible site stats, or plug-ins for Constant Contact, Google Analytics, and Twitter. Personalize your website using one of our curated WordPress themes. We’ve formed a partnership with one of the best theme foundries, Themify. Check out their themes here. We’ve licensed every one of their powerful themes. Or leverage the power of our WordPress’ open source platform to choose from thousands more WordPress themes available from WordPress designers around the world. Then complete your unique retailer branding by customizing your website with custom color schemes, Google web fonts, and custom buttons. Your Photogize WebCentral is built with WordPress and includes a robust Content Management System to keep your website constantly up-to-date with your newest products and prices, timely promotional offers, and seasonal messages, local photos and/or informative videos. WebCentral also has a full-featured blogging system – so your store and staff can share your insights and ideas and engage with customers and the world! We even have iPhone, Android, and other mobile apps so you can manage and update your content on the go! In Q3 2012, Photogize will launch Cart 2.0, a next generation, world class shopping cart filled with tasty HTML5 goodness. Sell any type of product, including hardgoods (camera, bags), softgoods (prints, photo mugs, photo books), or downloadables (high res files). Sell subscriptions (professional newsletters) and items that require recurring billing. And UPSELL each item by easily adding any unlimited number of free and paid options (framing, gift wrapping, mounting). You define your products right on the admin screen of your site. You can export your complete product listing to a CSV file for editing. Reimport after you’ve made changes. Or share products with colleagues. It’s easy to import new a product CSV with a few clicks. Reprice the products and fulfill them yourself. The shipping engine is flexible and powerful. You get live rates from USPS, UPS, FedEx and DHL. And the customer checks out on our unique ONE PAGE checkout. Simple. Payment gateways? We support virtually every one of ’em, including the most popular like: authorize.net, PayPal, Sage, WorldPay, and Chase. And all transactions are completed on a fully PCI compliant hosting provider. The Photogize WebCentral stack is installed at (mt)Media Temple, a next-generation provider that hosts some of the most demanding and media-intensive clients in the world like Adobe, Sony, Starbucks, and NBC. A single search button on your main page lets your customers search for hard goods, photo products, blog posts and more. Everything is indexed and searchable on a Photogize WebCentral site.